I was away at a conference recently, hosted by the Church Pension Group. They provide for many of the employee benefits at the Episcopal church where I work. 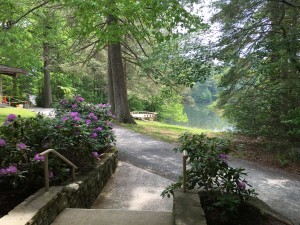 We stayed at a church camp/conference center in the lush green hills of North Carolina. We heard about proposed changes in the clergy pension plan; we heard about clergy going back to work after they’ve retired. It can be complicated. One day we experienced a lot of fun exercises that we can take back for our next staff retreat in our local church or diocese, and we also heard from an author, Martha Johnson Bourlakas, who also happens to be the wife of an Episcopal Bishop. She is a modern day Erma Bombeck, taking a funny and touching look at the human condition, and sharing much more than the “Christmas letter” version of her family life. Her book is titled Love Feast, and she talked about experiencing this agape meal, breaking bread, in the Moravian church. She then asked us to talk at our table about a meal we’d experienced that was full of love. It surprised me that my table mates were struggling to find an example. To be fair, as a food blogger, I write about a lot of my meals, and there’s usually a story about people that goes with them. I have a long list of stories from which to draw. The story I shared with my table, which they later shared with the entire group was the first meal we had with the Kautz family. Their younger son, Maciek, had interviewed Ed for a radio show he was doing about foreigners in our Polish city (International Poznań). After the interview, Maciek said to Ed that he thought we would hit it off with his parents, and ask if would we come to dinner sometime. A lot of thoughts ran through our minds after accepting the invitation. Will the parents speak English or will poor Maciek have to translate the entire time? Will we really hit it off or will this be an evening full of awkward silences? Do we need to know more people? That last one is craziness talking! Of course, we want to expand our circle of friends. We really did hit it off, and Maciek’s parents speak English very well. We dined outside, in their beautiful garden, had a delicious meal. It’s hard to top Polish hospitality. I later learned our hostess had been nervous about preparing the meal. It seems no one wants to cook for a food blogger. After dinner we sat on the patio for hours chatting and laughing until almost midnight. We had several more meals together during our time in Poland, and became good friends. Maciek was right. I’m glad he insisted, and that his family was willing to take a chance on us. Sharing a meal, breaking bread, can be such a special event. In no time at all, you can come to adore the people with whom you’re dining. We will visit Poland again, one of these days, and I know we will spend time with the Kautz family. Every couple of months, I’ll get an email from Maciek’s mother. We’ll catch each other up on our work, family life, travel, and our gardens. Her emails always brighten my day and make the eight time zones between us seem so much smaller. Breaking bread together, it binds people. How about you? Do you have a love feast story to share? PS — Maciek’s radio show spun off into a TV show. Here’s a link to an episode Ed did with him at the Polish air base. The episode aired several times, and it always surprised me to be scrolling through the channels and to hear Ed’s voice. I think every meal we’ve ever shared with you has been full of love Lois. You and Ed are family to us and it shows in everything you do. What a lovely story! I get the greatest pleasure from sharing food with friends around the table. Thanks for sharing! I had a feeling that you would!